The Oxford Advanced Learner’s Dictionary for iPad and iPhone is on sale this week at a full 50% off. It’s available for $14.99 – down from its standard $29.99 – as a special offer until April 15. The Oxford Advanced Learner’s Dictionary (OALD) is a world best-seller. It is now available as an app, with the full A-Z dictionary, real voice (not text to speech) audio, and My View to customize your screen. It has been developed by the same editors from Oxford University Press who created the printed dictionary, working together with Paragon Software, a leading software developer for mobile devices. — Words and example sentences read aloud in British and American accents. I’m impressed enough with the app, and the 50% off sale price, to have bought a copy for myself and also gifted the app to my daughter. 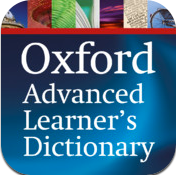 Here’s an App Store link for Oxford Advanced Learner’s Dictionary; it’s a universal app designed to run on both the iPad and the iPhone.